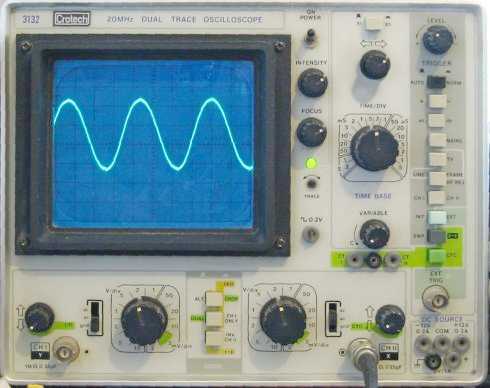 How to use an oscilloscope: Setting up and using a Cathode Ray Oscilloscope. Here's a few notes on how to use an oscilloscope. First off I am going to show you one very important point using my oldest oscilloscope and that is - they haven't changed at all! If you study the picture below then you'll see that all modern oscilloscopes follow the same basic pattern. OK these days they have more functions (and are now digital) but the basic method: how to use an oscilloscope remains the same. Even digital oscilloscopes follow the same basic pattern of the original oscilloscope design. So looking at them is just as relevant now as it was 20 years ago and its one of the measurement methods that has not changed except for modernizing it into DSPs. Tip: For a digital oscilloscope all you need to know is the location of the 'Reset button'!!! - this will get you out of all trouble as you can set up digital oscilloscopes in many different ways and they often have options buried in the depths of the menu system. Note: Before hitting the reset button - if someone else has been using it - save the settings (and possibly data) to an internal floppy drive or over the network to your hard disk - this will save you getting into trouble if someone else was using it. 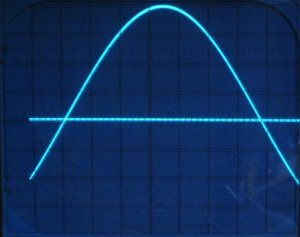 How to use an oscilloscope (or CRT) : Find the beam! The cathode ray oscilloscope (above) is the original oscilloscope and uses a high voltage cathode ray tube. Electrons are forced off a plate at one end using very high voltages (1000s of volts) and guided by electric fields to the phosphor screen that fluoresces when hit by an electron. Note: Never open the oscilloscope as these voltages are extremely dangerous they are high current and high voltage. Even 10mA at 250Vac can kill and voltages in the oscilloscope are far higher. Note: You have to set all of these appropriately - setting any one incorrectly will result in an invisible beam. The timebase sets the time that the beam is scanned from left to right on the screen and it's calibrated in horizontal divisions (the black grid on the front of the screen). The timebase (picture to left) is set to 0.5ms/DIV which means that the beam (ray) is moved through each horizontal division over the period of 0.5ms. So the time for going from left to right covering the whole display is 10x05.ms = 5ms (a frequency of 200Hz - 200 times a second) - for finding the beam this is a reasonable time. Make sure that X-Y mode is not selected as this disables the timebase - on this oscilloscope it is one of the controls to the right (black button in the green area). Sets the amount of electrons hitting the phosphor screen and it can be set it to zero - so you won't see a thing! So set it to about ¾ full brightness. Note: After you have found the beam turn it down as if you leave it on for a long time at a high intensity the phosphor burns leaving a permanent line in the phosphor. Each channel on the oscilloscope is really just a high quality amplifier with low noise, high bandwidth and selectable gain which connects to the vertical deflector in the oscilloscope. So if there is any input signal it will be amplified possibly moving the beam out of the display! set the channel input switch to ground (this switch is labeled DC, AC, GND). Setting it to ground connects the input of the amplifier to ground and ignores the input signal. Note: Remember to switch it back to DC or AC after beam finding otherwise you won't see any measurement! The trigger detects when to start moving the beam to the right across the display. Setting this to Auto makes the beam trigger continuously. It triggers continuously using the internal timebase unless there is an input signal in which case that is used instead i.e. you always see the beam regardless of the input signal. Note: If it is set to NORM then the oscilloscope won't trigger (unless there is an input signal) so again you won't see anything! The level adjust control moves the channel beam up and down on the display so you need to adjust it as the beam may be positioned outside the display. Each channel has a level control located beside the channel amplifier (here it's on the far right). How to use an oscilloscope : Setting up. Most oscilloscopes have a test point that generates a low frequency square wave (~1kHz) and you can use it to setup the oscilloscope and the oscilloscope probes. First of all adjust the focus and intensity (after finding the beam) to get the best looking display - a nice sharp line. Then set the input to ac and plug in the probe to the channel you are looking at and then attach the probe tip to the test point. You should then see the square wave - adjust the channel amplifier until its a good size in the display screen. How to use an oscilloscope : Adjust a x10 probe. Each probe has an adjustment screw terminal for probe compensation of the x10 mode. Note: Times 10 means that the probe divides down the input signal by a factor of 10. Inside the probe in addition to the resistive divider is a capacitive divider - the screw terminal is adjusting one of the capacitors. Adjust the trigger level so that the signal is stable and you can see a stable square wave. Adjust the probe while looking at the signal so that the square wave has sharp edges at all corners i.e. shows high frequencies accurately. There may be undershoot (rounded corners) or overshoot (spikes at the corners) just adjust the screw terminal until these disappear and you have no overshoot and no undershoot. You have now adjusted the probe correctly. Using the channel amplifier setting you can measure voltage here the amplifier is set to 0.2V per (vertical) division. Just adjust the channel amplifier setting until the signal you are looking at 'just' fills the screen - this gives the maximum (most accurate) view of the signal. 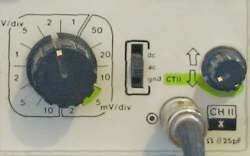 You can measure DC or AC signals by selecting the appropriate switch setting. GND sets the input of the channel amplifier to ground ignoring the input signal and it useful to find out where the zero volt reference is on the screen. Before you measure a steady DC signal set the switch to GND and move the trace to the lowest horizontal graticule (black lines on screen). This sets the zero voltage position - now set the switch to DC and put the probe on the DC signal - adjust the channel amplifier to keep the signal on screen. Count the number of divisions and multiply by the channel amplifier setting to read the voltage. Of course its easy to select an easy voltage and amplifier setting to start with e.g. 5V with a 1V/division setting will make the trace move up 5 graticule divisions. An AC signal is simply Alternating Current and is more commonly used to describe an alternating voltage as well and the text book AC waveform is the sinewave. To make the measurement the amplifier settings are used in the same way as a DC measurement but now you need to start with the ground reference in the middle of the screen. So set the input switch to GND and move the trace up to the center then set the input switch to AC. You need to do this as an AC signal moves above and below ground so to see the whole signal you need the ground reference in the middle. Now set the trigger level and adjust the channel amplifier so that the signal fills the screen and is stable. Here's an example of a AC sinewave centered about the mid graticule. and so the Vrms = Vp/sqrt(2) = 1.41Vrms. Note: The zero axis is shown by the other channel that is switched to ground - it just helps you to see the signal more easily and is not essential. But this is not the most accurate way you can measure the signal - to do that you have to maximize the displayed signal. 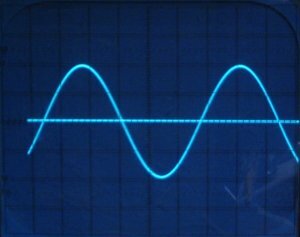 In the image to the right only half the signal is displayed because you know that a sine wave is repetitive and symmetrical. So you only need to see half the signal to fully characterize it. Note: This measures the period in the most accurate way I'll leave you to figure out how you could measure both period and amplitude more accurately. Tip: Buy a digital oscilloscope : All these calculations are done for you in real time - if you buy the right one - some also give you standard deviation, jitter and all manner of other measurements done using dsp.